Are you thrilled with your current food storage containers? Is there some improvement that you’d like? 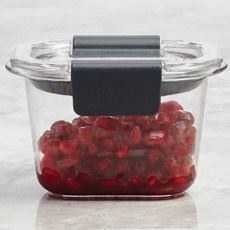 Take a look at the new Rubbermaid Brilliance Food Storage System: It has it all. This new line of storage containers sets a standard in fabrication and utility. We’re so excited about the Brilliance line. Nothing has been left out! Freezer To Microwave: Maximum flexibility. Fridge to Table: Salads and other refrigerated foods don’t need to be moved to serving bowls. Stain Resistant: No staining from red sauces and oils. The containers stay brilliantly clear, like glass. BPA-Free: They’re made from state-of-the-art Tritan® plastic with a sleek modern look. Made in the U.S.A.
Splatter-Resistant Microwaving Vents: The easy click-on lids are a dream. Unique Lid Design The air is sucked out of the container when you click the closures. Dishwasher Safe: Also, highly scratch- and ding-resistant and durable. Space-Efficient Design: The modular units stack perfectly. Leak-Proof Guaranteed: Carry soup and other liquids with no concerns. Odorproof: Store garlic and onions with no aroma leakage. The containers will be odor-free after washing. There’s everything from mini, to to store cut garlic and onions, to large, which holds the contents of an entire pot of stew. Organize: You easily see all contents. Efficiency: Stackability optimizes space in the fridge, freezer, pantry and on the countertop. Transporting: Carry your lunch, baby food, etc. Bonus: The containers are very lightweight! Pantry Storage: They’re airtight and stackable. Store nuts, dried fruit, flour, etc. Marinating: They’re 100% leak-proof and airtight. Entertaining: They look great on a buffet or at the table. 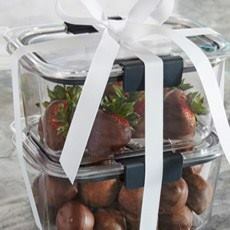 Gifting: Fill with cookies or foods, and a great container remains when the nibbles are gone. Earth-Friendly: No need to use disposable plastic wrap, storage bags, foil or other landfill. Store anything, beautifully. 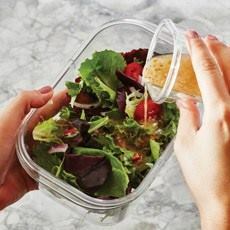 The 100% leak-proof design lets you transport soups, dressed salads, anything. 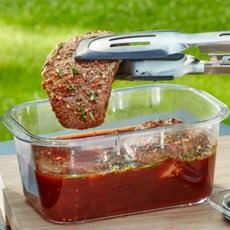 An airtight solution for marinating. The containers are a permanent gift, after the cookies are gone (all photos courtesy Rubbermaid). Prices range from $4.99 for an individual unit. The largest set, 22-pieces* (11 bases, 11 lids) is $64.14 at Amazon, which carries three different sets plus open stock (individual pieces). A starter set, 1 medium and 2 small containers, is $14.99. An 8-piece set (1 large, 1 medium, 2 small containers) is $38.86. If your goal is to better organize in the new year, treat yourself. The result: Brilliance! *Confusion alert: Manufacturers and retailers often call what consumers would think of as an 11-unit set as as 22 pieces, counting the bases and lids separately.